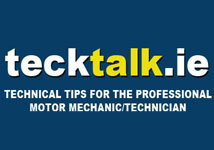 KYB Europe has launched a new support tool at Automechanika. The tool is the latest in a portfolio designed to help make it easier for technicians to fit shock absorbers, coil springs and mounting kits. KYB product boxes will soon display a QR code next to the part number. Anyone fitting this part will be able to scan the QR code using a smart phone, via any scanner application which can be downloaded free of charge from the smart phone provider. They will be offered a choice of information to help them with the fitting of that part. The information includes: fitting videos (where available), fitting instructions (specific to that vehicle application), common information for fitting shock absorbers and coil springs, plus a visual inspection prompt. More useful information will be added next year. Jean François Huan, Senior Product Manager for KYB Europe, commented “In Europe, KYB believes training and support are key elements in the success of its customers. 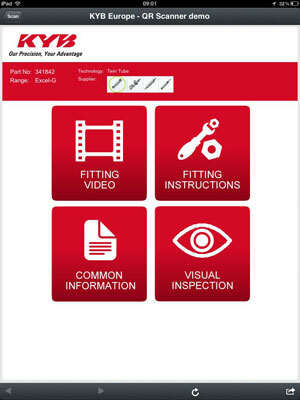 KYB is working hard to provide valuable technical assistance for its customers and this QR code scheme adds to our training programme for technicians to help replace shock absorbers and coil springs on a car”. The project launches with 700 references and will grow quickly over the next few months. It will also become integrated into KYB Europe’s website, so that technicians who do not have access to a smart phone can still use the support for fitting KYB parts. Worldwide, KYB manufactures more than one million shock absorbers a week and is the world’s largest original equipment (OE) supplier to vehicle manufacturers, with one in four cars leaving production lines being fitted with KYB shock absorbers as standard.